While CBS still won’t run medical marijuana advertisements during the Super Bowl, a Florida company just ran the first-ever ads for cannabis-based products in Times Square. 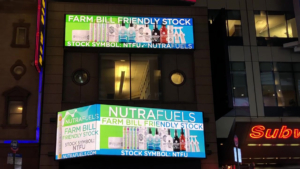 NutraFuels, a nutraceutical manufacturing company with a line of hemp-derived CBD products under the brand NutraHempCBD (www.nutrahempcbd.com) was in the first digital billboard cannabis campaign in the famed intersection. “This ad campaign was our way to celebrate the deregulation of hemp and create awareness of its health and wellness benefits,” said Edgar Ward, president and CEO of NutraFuels. While companies with hemp and cannabis products in the past have tried to buy ad space in Times Square before, the marketing debuted concurrently with a change in the law. Until this year, federal law technically classified all parts of the cannabis plant as marijuana, a scheduled narcotic. But the 2018 Farm Bill, as explained by the Billings Institute, differentiated hemp, a part of the plant containing less than 0.3 percent tetrahydrocannabinol. Better known as THC, that’s the stuff that gets people high. “This campaign was our way of celebrating the Farm Bill and the deregulation of hemp,” said NutraFuels spokeswoman Chloe Sommers. While the federal government long turned a blind eye to the sale of hemp and CBD oil, which can be sold in all 50 states, major media companies would not accept an advertisement for a product still technically prohibited by law. It’s much the same reasoning that led CBS to reject an advertisement for Acreage Holdings, which sells medical marijuana, on the grounds the government still considers the sale of the product a crime. But after the deregulation of hemp and CBD, Honeysuckle Magazine, a lifestyle magazine that regularly writes about the organic products, got approval to run a Times Square billboard campaign. “It sounded interesting to me, so I jumped on the chance,” said Ronit Pinto, Honeysuckle owner. She offered space to many of advertisers working with her company, and many cannabis-related brands took part, including NutraFuels. It turns out, the campaign marked the first time anyone sold cannabis-based products like hemp and CBD on a Times Square billboard. NutraFuels advertised its in-house CBD product NutraHempCBD. The ads provided tremendous exposure for the Coconut Beach-beached company, which employs about 12 people. The Florida business remains one of the companies that’s continued to participate in the campaign as ad buys stretched into February. The campaign still faces certain restrictions, Pinto said. There can’t be any pictures of the actual cannabis plant. Advertisements also can’t show drug paraphernalia as the content must focus on those cannabis products legal under the new farm bill. But the high-profile advertising could mark the first entry into mainstream marketing for a growing cannabis industry. Maybe the Super Bowl in 2020 will see such products promoted in commercial breaks. “When it comes to cannabis, until the federal cannabis laws change like the hemp laws were, national media companies will be unlikely to accept their advertising,” said NutraFuels spokesperson Chloe Sommers. “This positions CBD products well and it looks like it will only get better with time.